Okay first! When I say “diet”, I very much mean “a way of eating”, and NOT “a way of eating to lose weight“. Yes? Important difference. So with that said, I’ll let you in on a little secret. I’ve spent the past nine months engaged in a series of experiments: a set of proofs and challenges leading to a catalogue of responses and eventually, to results. I’ve kept this to myself for a number of reasons, not the least of which is my concern that people may take my own experience as a some sort of prescriptive advice. Which is really not my intention. But, I think this journey has been pretty interesting, and I’ve learned a whole lot, and ultimately, I’ve been able to take myself from a piss-poor state, to a really amazing place. Maybe others will find solace in my story? I hope so. I have never had an eating disorder. However, I also haven’t always had an easy relationship with food, and I think that at times my behavior could have been considered borderline “disordered”. I’m not any kind of -rexic and I only ever made myself puke one time, when I was 17, and that was way more about drama than it was about food. What I can be is an emotional eater, though I’m not convinced that “emotional eating” is, by definition, always unhealthy. For example when I quit smoking, I made the completely conscious decision to use food as a coping mechanism (quitting was incredibly emotional and very stressful for me). I went into that situation with my eyes wide open, and I used food as a tool . . . and it worked! I’m really not so sure that I would have been able to quit smoking otherwise (at least not with my lifestyle/relationships in tact). So part of me feels like there is a place for mindful emotional eating, though I’m certainly no expert on the subject. To be clear, I’m not talking about full-on stress-induced indiscriminate binging, which is unhealthy under any circumstances. And in those situations there seems to be a physiological, as well as a psychological, component. I know that in my own experience it’s always a combination of the two, but seems predominantly driven by an actual physical response (more on that later). But when I say that emotional eating may not be unhealthy, I’m not referring to binging. I’m talking about . . . getting to the end of a very long, very hard day, and thinking “I would really love to curl up with a cookie and a cup of cocoa”, and then being comforted by doing it. Is that inherently unhealthy? Your thoughts? After Waits was born my wellness took a nose dive. A few weeks after giving birth, I had developed an internal Candida (yeast) infection, my hormones were all over the place, my moods were up and down, and I was tired all the time. A lot of this is typical “new mom” stuff, but everything was exacerbated – and rooted in – what I knew was a problem with the way I was eating. I was plagued by a cycle of blood sugar spikes and crashes (physiological), seemingly out of my control, which wreaked havoc on my emotional stability (psychological). I was quickly reaching a breaking point. As all this was happening, I was saturating myself nutrition literature, and I quickly learned of the contradictions and inconsistency that run rampant in the health world. Was I suffering from a sluggish thyroid? Metabolic disorder? Gluten allergy? Adrenal fatigue? No one agreed on anything! And even if they did, they couldn’t agree on the cause, and they wouldn’t agree on a treatment! That’s when I decided to take matters into my own hands. Drawing on all my research, cutting and pasting theories to create a general framework, I pieced together my own mish-mash of an agenda. The new year seemed as good a time as any, so on January 1st, I began my testing. Honestly? I was worried about being judged. I worry the same way about posting my food journals (WIAW). I mean, I know what’s going on in my head and I know that I’m alright, but I also know that people perceive things in wildly different ways. Do people look at me and think I’m crazy? Do they think I have an eating disorder? Truth: there IS a lot of disordered eating in the “healthy living” blogosphere. Period. But it’s not always so cut and dry. Orthorexia is defined as “an unhealthy obsession with eating healthy”, but do you see the problem with that definition? Um, doesn’t the premise assume that we’ve agreed on what “healthy” means? Because, you know, we haven’t! Orthorexia is an accusation that’s hurled around a lot these days, the en vogue ED of our day. But I’m not sure I buy orthorexia as anything more than a subset of anorexia. What seems normal and “healthy” to one person may seem extreme and insane to another. That’s a slippery slope. For example, I’ve read articles where the author (a professional, mind you) insists that all raw foodists – even all vegans! – are de facto orthorexic. And certainly, if you’ve got yourself convinced that grains are evil, gluten is satan, soy is toxic, sugar in all forms causes cancer, processed foods are pure poison, and on and on until all that you’re eating is organic raw kale, well then yes, you have a problem. But really, if all you’re eating is [calorie-deficient] raw kale, then isn’t your problem actually just anorexia? Am I wrong? For me, I had to trust my body and do my work from the inside out. And I did. Over the course of the last nine months I’ve gone from feeling horrible and unhealthy, to experiencing sustained energy and vibrant health. I cured my Candida. My blood sugar is almost always stable. And my mood swings, when they do occur, can most likely be attributed to my lady bits and their monthly cycles (damn it!). Best of all, I have an awesome, positive, easy and enjoyable relationship with food, choosing my meals based on what makes me feel the best. Most of the time that takes the form of foods that most people would deem as “super healthy” (I just call them yummy), and some of the time that turns out to be . . . coconut ice cream! Or whatever. I don’t stress about it, because finally, FINALLY, I’ve found my balance. It’s a beautiful thing. And over the next few weeks, I look forward to sharing how I got here. Totally Ginger! Exactly what I was thinking when I was writing that obscenely long post! By forcing kids to eat (especially when they’re not hungry) they will most likely not learn to trust their own hunger signals and have weight issues as a result. And, trust me, getting weight off is not much fun. I did the same thing for a while, and actually went underweight. I’ve always been on the edge, and doing that tipped it over. Now I make sure to balance my meals with protein and calories as well as nutrients. This is excellent! I love the idea of using food to heal our bodies instead of immediately jumping to pills. I am so happy you have found a healthy balance in your life and can’t wait to read about it! I want you to know it took me literally DAYS to figure out ‘ED’ was “eating disorder”. I totally thought you were talking about Erectile Dysfunction. Which is ironic because Pollan is actually anti-vegan . . . The raw cookbook is coming out in late January, but my involvement with the project ended up being less than originally anticipated. However, it will feature many of my recipes and photography! This comment makes me sad, but I also really appreciate it. And, I can relate to it! It’s so easy to see the way other people eat (or dress/act/parent/live/whatever) and then build an ideal around it. The problem is that there’s no such thing as perfection, and if any of us try to live up to what we perceive as perfection in somebody else, then we’ll always fall short (and end up getting down on ourselves). I think this is a really common and unfortunate occurrence in the blogophere, but I’m glad that you’re self-aware enough to realize it and take a step back. Like I said – I relate! I totally understand this. I’m seriously not trying to sell books or anything, but I do have a great section on eating for breastfeeding in my book, if you’re interested. Also, please feel free to email me if you want to chat about it! Hi Georgia, I just wanted to say thank you so much for this comment and for sharing your story. I like what you said about all eating being emotional to some degree or another – I think there’s truth in that! I’m also really glad to hear that you are in recovery. Good for you! Are you familiar with Gena’s work over at ChoosingRaw.com? She has a whole series called “Green Recovery” where people share their stories about how adopting a plant-based diet actually helped them to normalize their disordered eating. Sounds like it might be right up your alley! I was broke and actually without insurance (Damian was switching jobs, really bad timing!) so I was completely an armchair MD/Doctor Google/internet self-diagnoser. And actually I really really don’t recommend that. I got lucky in that I self-diagnosed correctly and was able to correct my issue on my own, but I don’t think that’s often the case. I strongly suggest seeking out a Naturapathic Doctor in your area. They will have experience with diagnosing and treating Candida. I love this comment Ali, and seriously congratulations on all you’ve accomplished in your journey so far! I mentioned it above to Georgia, but are familiar with the “Green Recovery” series on ChoosingRaw.com? I know you’re an awesome blogger yourself – you should consider contributing! Great point. It was one of the things that most struck me when I was at Vida Vegan Con. Basically, that a room of 250 vegans looks EXACTLY like a room of 250 omnivores. Some are thin, some are fat, some are punks, some are button-down, some are very young and some are elderly, etc. There is no typecasting in veganism! All of this resonates with me and damn, it’s just so true about the conflict and contradictions. I just have to say – I feel for you! I understand your frustration! Hi AJ, I’m so sorry if you felt like I was trying to downplay EDs. That was not my intention at all! I am very aware of the seriousness of them (my best friend suffered for years and years, it was horrible to watch). I totally agree with you in your analysis of disordered eating. I will make sure to be extra sensitive as I write about htis subject in the future! That is a REALLY great point and an important distinction. Thanks for putting it in those terms. I think I’m less afraid of being judged than I am of being misunderstood, if that makes sense? I am, indeed, an avid reader of Choosing Raw! I’ve been contemplating writing a piece for her Green Recovery series for quite a while now, but haven’t found enough time in my schedule to do so yet. But you’ve reinspired me to contribute! Thanks again, Sayward. Thank you for such a sane, down-to-earth approach in this subject! It is so great to hear that you’ve been able to improve your health by making such dietary changes. People are always telling me (some even in a critical sort of matter), how ‘healthy’ I eat and how ‘good’ I am, but for me it’s just a simple thing of having realised what works for me and what makes me feel good. 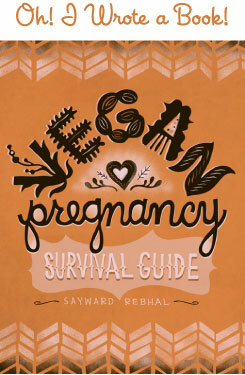 I am beyond excited to have found your blog also because you have shown such a great example on how to maintain a vegan diet whilst pregnant/with a child. I am an ovo-vegetarian (although I don’t particularly like the term) and wish to maintain this way of eating if/when I fall pregnant. Thanks again and I am really looking forward to reading your posts and your upcoming book! Have you written up anywhere the process you followed with your elimination diet to get rid of the systemic candida infection? My husband is fighting the same thing, and since you succeeded with clearing your body of the infection it would be great to read what you did. I apologize if this has already been asked, I’m still reading through all the comments at the moment. Never mind – found the post where you say you’ll be discussing it next. The diet trial is fascinating reading! Ah! Finding this blog was meant to be, I’ve just started a plan of my own to get back to ‘health’ (whatever this may be) I’ve been doing some really disordered eating in the last year because I’ve got terrible reflux (and no doctor can work out why) and then found out I had glandular fever and low iron. I get really obsessed with researching things and finding things out, so I thought i’d channel it into something useful and made a full out health plan. Eep! Looking forward to reading more of your work!